The little mountain town of Buena Vista, Virginia, again hung out the "Welcome Guzzi Riders" signs, this time for the 21st Annual Virginia Moto Guzzi rally, as a record throng of 150 titanium-tailed Guzzisti descended on Glen Maury Park for three days of riding, socializing, eating, music, and tale-swapping in the company of their fellow enthusiasts. The weather was predicted to be good, and the predictions held up; a mix of clouds and sun, hot enough riding in the valleys that you were glad you had a mesh jacket, and cool enough on the ridge-tops that you wished you'd packed the liner. True Blue Ridge Mountain weather, and suitable for bedrolls, tents, camping trailers, or motel rooms, whichever suited one's fancy (or pocketbook!) 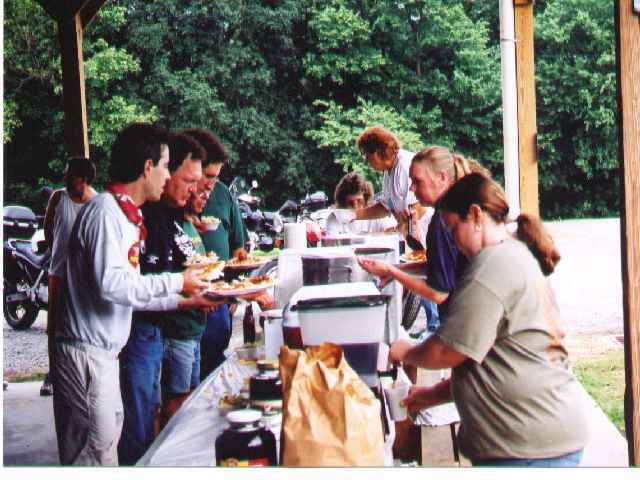 Two-thirds of the folks slept on the ground, and the rest in rooms in town or in campers in the big park. Being a prototypical tight-fisted Guzzi type, I prefer a tent, where the slowly fading buzz of conversation at the next campfire about past epic Guzzi voyages and hair-raising adventures acts like a lullaby (at least until the snoring starts!). Friday afternoon saw us checking in, checking out the new T-shirt designs and adding them to our collections, checking out Joe Kenny's new head-guard and belt-buckle artwork, and checking on friends as they cruised up to a stop from states as far away as Iowa and Illinois, covered in an honorable film of road dust and (sometimes) oil (might as well admit it; no Guzzi is perfect). Friday evening brought us an all-American backyard picnic of hamburgers and hot dogs with all the fixings; potato salad, cole slaw, and iced tea. Topping off the evening were "The NiteOwls", a very talented band that brought us a mixture of blues, western swing, classic rock, and anything else you could think of. We've certainly decided that we need more couples coming to this event; 10 men to every woman does NOT tend to fill up a dance floor quickly! The talent of the band was enjoyed and appreciated. Afterward, the talk continued into the wee hours of the morning as everyone caught up with the doings since last year; roads ridden, bikes bought and sold, what accessory works and what doesn't; Guzzi talk. Saturday morning had many folks sleeping in, but by 9:00 everyone was up, coffeed and breakfasted, and most were pouring over the maps from the rally packet and planning out the day's riding. A rider might come to this rally for 20 years and still not ride all the good roads that are within a day's riding range of the rally site. Gradually, groups started forming up and peeling out of the park. The clip-on-and-peg-scraping set fired up their LeMans models and Sports, crouched into their fighting stance, and went hunting in packs of four and five for oriental sport-bikes to humble (successfully, by all accounts); a dozen of us more sedate (not to say sane) cycle-motorists formed up behind Gary Cobb to see what new and unusual roads he'd found this year for the guided ride. Gary was on a 1981 Police G-5 that was even more eclectic and roadwarriorish than last year's lead bike; a true triumph of solid function over mere aesthetics. Gary led us up, down, and around the lush green mountains for about 160 miles, stopping for lunch in Waynesboro and luckily bringing us back in time for dinner. Folks continued to congregate around the new Guzzis that Carl Lucci had brought down to the rally from Winchester Motosports, especially the new Breva that had someone or other sitting on it trying it out for size almost every minute of the day. Everyone agreed that it was a beautifully executed piece of work, and there are high hopes that it will be the means for introducing a whole new group of riders into the world of Guzzi. Time will tell. Dinner on Saturday was as if you had gone home with your Italian buddy and had his Mama cook dinner for you; penne-rigate pasta topped with your choice (any or all three) of Italian sausage, meatballs, and white-clam-and-shrimp sauce, with a salad, a big chunk of Italian bread, and a variety of desserts. Mama got a big round of applause when we were done! As rally-goers leaned back and loosened their belts after dinner on Saturday evening, it was time to announce the awards and the door-prizes. Roger and Marilyn Davis coordinated the door prizes this year, even though they had been married only a few days before and were making the rally part of their honeymoon! (Some witty and pointed comments were loudly made by the assemblage on this subject in "honor" of the happy couple, as you might imagine!) Prizes ranged from jackets and $150 (!) AirHawk coupons through books, cases of oil, shirts, hats and accessories. A $279 50/50 pot was split between winner Robert Johnson and the rally fund. Then it was time for the recognition of special guests and award winners, including MGNOC state reps Mark Tenney and Barbara Nowell from North Carolina and Bill Sharp from Maryland. 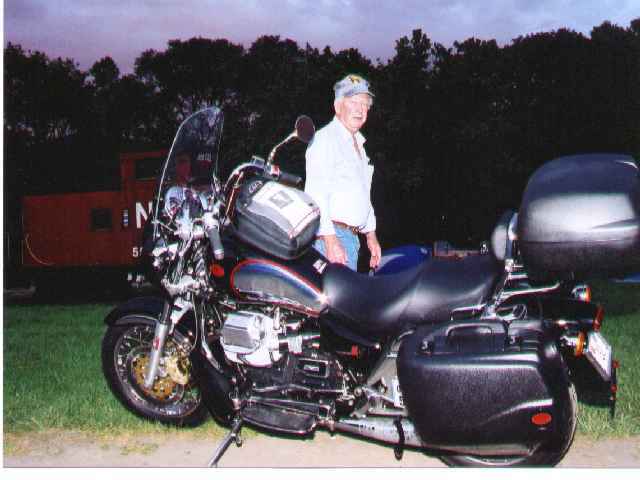 Long Distance Guzzi (Male) - John Culbertson, 1150 miles from Red Oak, Iowa. 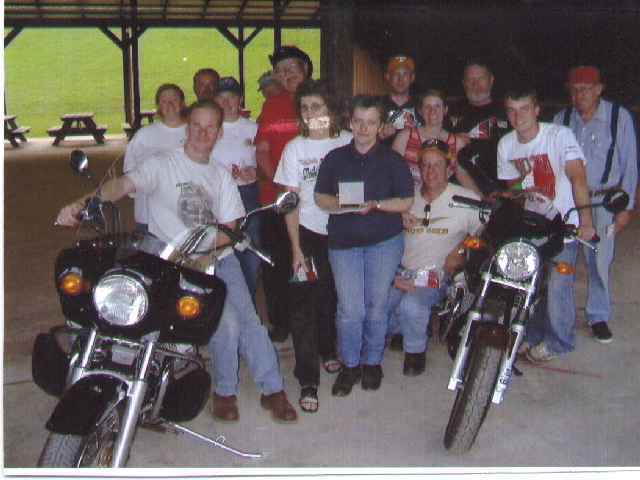 Long Distance Guzzi (Female) - Tracy Culbertson, 1150 miles from Red Oak, Iowa. 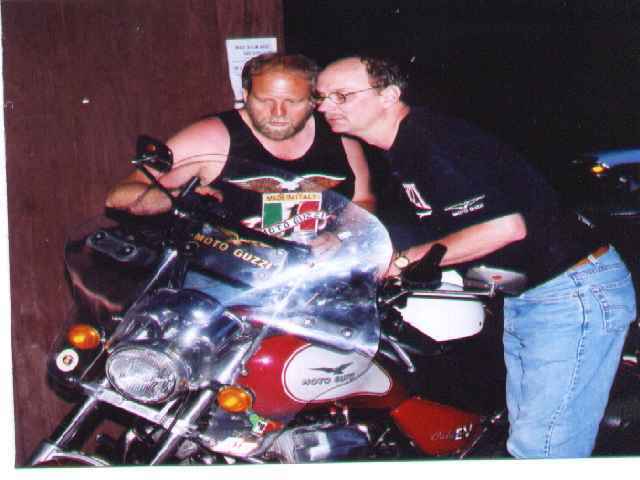 Long Distance Non-Guzzi (Male) - Jerry Baker, 812 miles. Long Distance Non-Guzzi (Female) - Kim Davis, 404 miles. Long Distance, Two-up Guzzi - Robert Johnson and Bobbie Newton 550 miles. Long Distance Non-Guzzi - Jayson and Carrie Kirby, 414 miles. Senior Rider - Doug Stone, age 79. Youngest Rider - For the 15th consecutive year, Adam Mellor, age 19. Rare Bird - Ed Journey's Guzzi-powered "Triking" Morgan-style three-wheeler. Chuck Galbraith award - Pat Galbraith, custom lowered Ambassador (Best Loop-Frame). Rallymaster Special award for "Hardest Working Woman I Know" - Alice Komoroski. Anticipating some long rides home the next day, Saturday night quieted down soon after midnight, and the dawn birds were singing all too soon. The "men-only-in-the-kitchen" breakfast of pancakes, sausage, juice, and coffee was ready by 7:30; the Long Distance Couple had only 36 hours to be back at work with 1200 miles to ride their two Guzzis, so we saw them off first; the rest of us finished up eating, breaking camp, and saying our good byes before hitting the roads home. 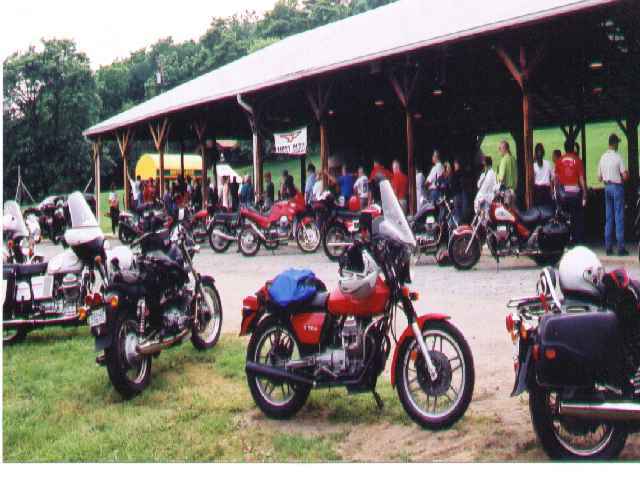 Ron and Alice Komoroski have put together a rally that is attracting record numbers of people, and we're all hoping for continued attendance from the extended Guzzi family all over the country next year. Be sure to get your pre-registration in early for 2004; same time, same place! The Virginia Rally is one not to be missed! Doug Stone, 79 years old and rolling strong! Nope, not a GPS - a zoom-zoom meter!